In the business they often ask me, why I think it is a good idea to invest in that company. A seriously good question and my first answer is that the person behind the idea is very passionate about his or her business. Ofcourse we look if it is financially feasible, that there is market research, growth and many more….but still I never ask the financial people to look at it before we meet the entrepeneur and have them talk about his or her passion. The pursuit to happiness, the journey to success and many more roads you have to take to reach your goal is with a lot of set backs. 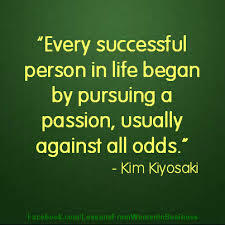 A genuin person who finds his or her passion will have the will and drive to never give up and find ways to get there. That person is flexible to adapt, but doesn’t give up on his or her passion. These are in general the winners and often against all odds, they come up with award winning ideas. I met sports people who became winning coaches due to their own injury, entrepeneurs who had to build several times from scratch their company and concept to get to their destiny. The passion of those people makes them overcome their losses and set backs. Their feeling and strong beliefs are contagious for other people, they spread out their passion as an ambassador for their…..company, life, idea….their passion. So my investment advice is at first, do we have a passionate person behind the idea….lets get started.